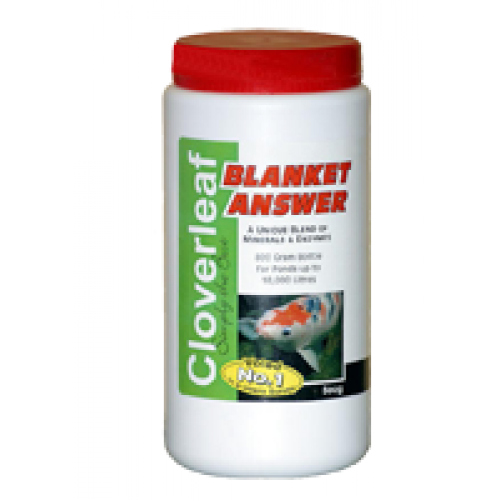 “Blanket Answer” is a unique blend of minerals and enzymes . The special formula works where many bacteria cultures fail. It is 100% safe for all pond fish, plants, and biological filtration systems. UV units or protein skimmers need not be switched off. 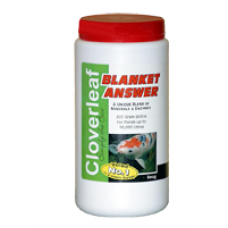 Unlike other products on the market Blanket Answer is simply added to the pond by pouring the mixed powder and pond water from a designated watering can evenly over the surface. The pond will initially take on a milky appearance, but this will clear after about 5 days. The ingredients will form a powdery layer on the liner face. Important : As with most water additives, the pond should have a good level of oxygen saturation. For optimum results use in water temperature of more than 10 degrees centigrade. During and after applying, wash hands, and store the product in a dry place away from the reach of children. The introduction to the pond of any chemicals or treatments should be at least 10 days from the application of Blanket Answer. Blanket Answer will start to work immediately, and will contribute to the filter mediums staying cleaner. Remember, nothing is to be gained by applying a higher than recommended dose. 800 gram bottle will treat ponds up to 10,000 litres .1 level scoop treats 285 litres (65 gals). For health & safety advice see bottom of page.